The only mattress with integrated defense against the geopathogenic influences of Earth. A Mattress with unique characteristics. The geomagnetic disperser in the mattress's core is patented. Zone Free From Harmful Geopathogenic Influences. Dirven by our desire to provide to you calm and healthy sleep, we created the mattress Matterra, which ensures you with protected zone for sleep, rest and comfort. The Only Mattress with Built-In defence against the geopathogenic influences of the planet. What Are The Geopathogenic Earth Zones? The basic theories of the magnetic fields that cover the Earth’s surface and exert substantial influence on humans were developed by the scientists Hartmann and Curie and are known as Earth’s energy grids. Hartmann’s Grid spreads over the whole surface of the Earth and resembles a rectangular grid of 2m on the north-south side and of 2.5m on the east-west. The strongest influence is exerted at the crossing points where they have a positive and negative charge in a sequential pattern, and both are unfavourable for human health. Their intensity is vertical and exerts forces even at the highest floors of buildings. Underground waters exert the same harmful effects. The worst situation occurs when a cross-point from a Hartmann’s grid happens to be situated under one’s bed or working place and also coincides with underground water. How to Protect Ourselves against the geomagnetic influences? Being one of the leading mattress manufacturers, we concentrated our efforts on developing a product that solves this problem. We developed the MATTERRA mattress with a built-in defense against the geopathogenic influences on human health. This protective device has a patented structure that disperses in a concentric mode the harmful influences outside of the mattress surface. 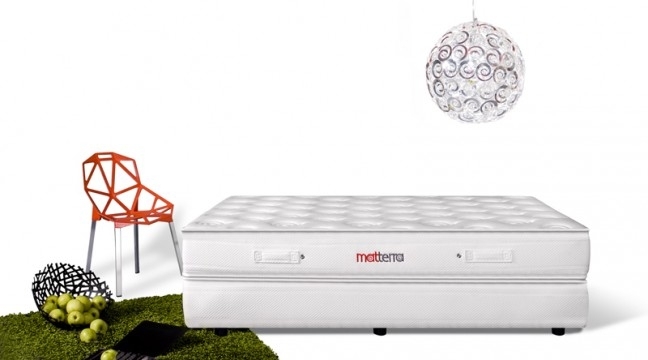 In this way MATTERRA ensures the most favourable conditions for human health and rejuvenating energy during sleep. MATTERRA is certified under LGA Quality Test GmbH in Nurenberg, Germany with the maximum score of 100 points. All used materials are ecologically tested and pure.The packaging materials are recyclable.